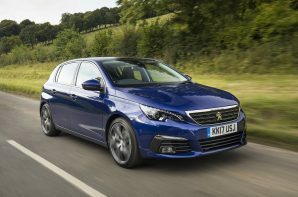 The Peugeot 308 may be getting a bit long in the tooth but it has proven a big hit with buyers and to our eye remains one of the best looking family hatchbacks. The latest round of updates include some minor styling tweaks but the biggest change is a new diesel engine. The previous 1.6 litre diesel lump was still competitive in terms of performance and class leading in terms of official fuel consumption, but to cope with the latest tests it was time for a revamp. The result is a 1.5 litre unit which offers more power and torque whilst meeting the stricter emissions tests. On the inside the 308 remains the same with the divisive i-Cockpit design taking centre stage. The idea is that the combination of an unusually small steering wheel and the instrument binnacle set higher should combine to give drivers a clear view of the instruments without taking their eyes off the road. In reality some people find that the steering wheel blocks the instruments completely, which is far from ideal. It is a design that we really like but that’s because we can see the binnacle. Assuming that you pass the i-Cockpit test, there is much to like in the way that the 308 drives. That small steering wheel contributes to a feeling of nimbleness, but there is some physics at play here too. The 308 is admirably light, lighter in fact than many Superminis and that tells as soon as you approach a corner. It also allows the suspension to remain supple enough that you don’t wince every time you see a bump. The 308 remains a good looking family hatchback that combines a good balance of driving fun and ride comfort whilst also achieving excellent official fuel consumption. The biggest question is whether the i-Cockpit makes or ruins the experience for you, so whilst we always recommend taking a test drive before buying, in the 308 this is crucial.